continue with the 5 decades of the rosary beginning with the 1st decade, each with a mystery of the decade followed by the prayers of each decade. Jesus revealed His glory by the miracle at Cana. The new couple was blessed not only with wine, but with faith in Christ. Let us pray for strong marriages, rooted in the Lord, and open to the gift of new life. Mary is troubled by the angel's greeting, yet rejoices to do God's will. Let us pray that those who are troubled by their pregnancy may have the grace to trust in God's will. John the Baptist leapt for joy in his mother's womb. We pray that people may realize that abortion is not about children who "might" come into the world, but is about children who are already in the world, living and growing in the womb, and are scheduled to be killed. God Himself was born as a child. The greatness of a person does not depend on size, for the newborn King is very small. Let us pray for an end to prejudice against the tiny babies threatened by abortion. The Child is presented in the Temple because the Child belongs to God. Children are not the property of their parents, nor of the government. They - and we - belong to God Himself. The boy Jesus was filled with wisdom, because He is God. Let us pray that all people may see the wisdom of His teachings about the dignity of life, and may understand that this teaching is not an opinion, but the truth. When Jesus is baptized, the Father's voice is heard: "This is my beloved Son." All are called to become adopted sons and daughters of God through baptism. We pray that children in the womb may be protected, so that they may be born and welcomed into the Christian community by baptism. "Repent and believe the Good News." Let us pray that these first words of Jesus' public ministry may be heard by all who have committed abortion. May they know that the Lord calls them to conversion, and may they experience life-giving repentance. "This is My Body, given up for you." The Eucharist teaches us how to live and how to love. Let us pray that parents who sacrifice the babies for the sake of themselves may learn instead to put themselves aside for the sake of their babies. Let us pray for mothers and fathers who are in agony because they are tempted to abort a child. May they be given the good news that there are alternatives, and may they make use of the help that is available. 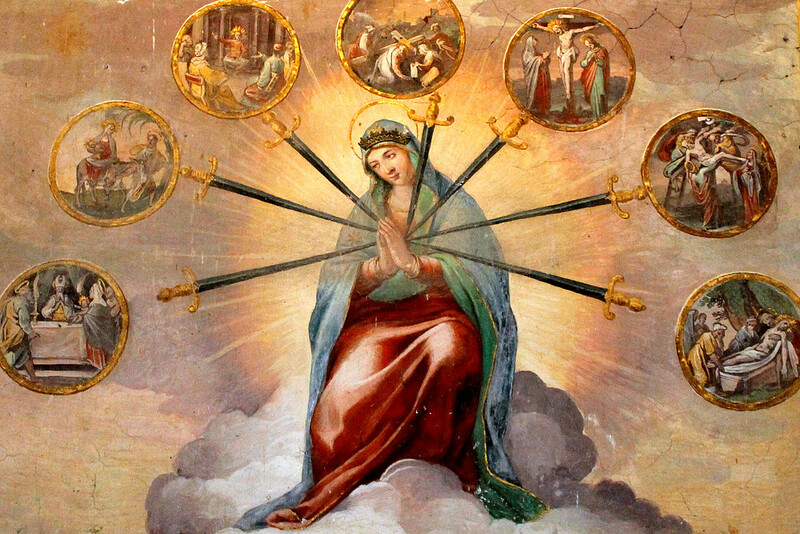 As Christ's flesh was torn by the instruments of those who scourged Him, so the bodies of babies in the womb are torn by the instruments of the abortionists. Let us pray that abortionists may repent of these acts of child-killing. Jesus suffered the pain of thorns in His head, and did so silently. We pray for the mothers and fathers of aborted children. So many of them suffer deep grief and regret over a choice they can never reverse. So many suffer in silence, because others tell them it's no big deal. Jesus was not condemned by the power of wicked people. He was condemned because of the silence of good people. Silence always helps the oppressor, never the victim. Let us pray that we may never be silent about abortion, but rather will clearly speak up to save babies from death. As we ponder the death of Christ, let us remember the many women who have died from so-called "safe, legal" abortions. Let us ask forgiveness and mercy for them. May their memory save other women from making this tragic mistake. Christ is Risen! By his Resurrection, He has destroyed the power of death, and therefore the power of abortion. The outcome of the battle for Life has already been decided: Life is victorious! Let us pray that all pro-lifers will spread this victory to every segment of our society. By ascending to the Father's throne, Christ takes our human nature, given to us in the womb, to the heights of heaven. He shows us that human beings are made to be raised to heaven, not thrown in the garbage. Let us pray that the world may learn this truth and reject abortion. The Holy Spirit is the Advocate: He pleads our cause, for we cannot save ourselves. We pray that He will make us advocates for the babies, who cannot speak or write or vote or protest or even pray. The Blessed Virgin Mary was taken body and soul into heaven because she is the Mother of God. Mother and child are united. The Assumption reminds us that they belong together. We pray that society will see that it cannot love women while killing their children, and cannot save children without helping their mothers. We pray that people will be touched by the pro-life question, "Why can't we love them both?" Mary is the Queen of the Universe. The Church teaches that she is the greatest creature, second only to God Himself. The Church defends the dignity of women. We pray that people will understand that to be pro-life means to be pro-woman, and that to be pro-woman demands that we be pro-life. O my Jesus, forgive us our sins, save us from the fires of hell; lead all souls to heaven especially those who are most in need of your mercy. Continue with the next (1st, 2nd, 3rd, 4th, 5th) decade of the rosary. At the end of the 5th decade, say the prayers at the end. Lord, grant me the grace of humility. The Annunciation is a symbol of humility, of submission to the will of God. As Mary must have struggled with her own puzzlement at the angel's annunciation, her response melted into total acceptance of God's will, through her prayer. Through her appearances on earth, in this century, is she proclaiming our own annunciation? She asks for our submission to God. Our Lady has always spoken of the great sin in the world; a world composed of pride and ego that feels it no longer has need for God. She would want us to pray for humility, for submission to God's will. Let us offer this first decade of the rosary, in reparation; in reparation for all who revolt against God's will, against the call of their own conscience. Let us pray especially for the Church, for all bishops, priests and all those in religious life that they might serve God with humility and imitate Mary, the "Model of the Church, the Mother of the Church." Lord, grant me the grace of love of thy neighbor. Let us pray this decade in thanksgiving; in thanks to God for coming to us through Mary. For greater recognition of her role, her acceptance to God's will. Lord, grant me the grace of poverty of spirit. He is with us. The word was made flesh and now Jesus Christ is with us. What impact does that have on us today? He came not as a king, or a ruler, but as a poor infant, born in a manger, accompanied by shepherds. And to such humble beginnings, every knee must bend. What gifts do we bring? He is still with us, in all things, in all lives, the Prince of Peace. What gifts do we give? Bring joy, bring love and praise Give your heart. Give your trust as Joseph did. Lord, grant me the grace of purity of mind, body, heart and will. Mary and Joseph, in compliance with the laws of their land, brought the infant Jesus to the temple for consecration to God the Father. She is still presenting Him to us, everyday. Offering her Son everyday to us, through the Mass, through His graces, His blessings. She also attempts to present us to God everyday; to dress us in holiness, goodness, obedience and humility for presentation to her Son. All of her appearances on earth have attempted to do just that. In this decade Mary's coming sorrows are revealed; for her Son, Jesus, and now for us. Let us pray this decade for Mary's intentions. That all of her children may accept her role as intercessor in preparing us to be worthy of presentation to her Son, Our Savior. And let us offer here, our personal intentions asking for Mary's intercession, and our own submission to God's will. 5th Joyful Mystery: The Finding of Jesus in the Temple. Lord, grant me wisdom and the grace of obedience. Mary and Joseph searched in sorrow for three days before they experienced the joy of finding Jesus. What anguish there must have been over the lost child, over what might have happened to him. She is still searching today for all of her lost children. Do we see in this event, an example of the constant need to search for the lost? Let us offer this decade for conversion. For all those who have wandered away from God; for those who have lost their faith; for those who give their life to the false gods of the world, money, materialism, and pleasure. I, as Mother, love you all. I love you all even when you are far away from me and my Son. I ask you not to allow my heart to weep tears of blood because of the souls who are being lost in sin. Therefore, dear children, pray, pray, pray! Continue with prayers at the end. Lord, grant me gratitude for the gift of faith. "The Baptism in the Jordan is the first mystery of light. Here, as Christ descends into the waters, the innocent one who became “sin” for our sake, the heavens open wide and the voice of the Father declares him the beloved Son, while the Spirit descends on him to invest him with the mission which he is to carry out." Let us pray for humility. We are beloved disciples of Jesus and need not be impeded with a desire for human recognition. Let us hunger to follow Jesus in all ways, at all times, and through all things. Lord, grant me the grace of fidelity. "The second mystery of light is the first of the signs, given at Cana, when Christ changes water into wine and opens the hearts of the disciples to faith, thanks to the intervention of Mary, the first among believers." Let us pray for trust in Jesus for all our needs. Let us pray also to trust in the intercession of Mary. Mary trusted in Jesus to aid at the wedding in Cana. With her motherly instruction, "Do whatever He tells you, " shows her trust in her Son. She didn't understand how He was going to do it, only that He would. Pure trust, simple trust. Lord, grant me the desire for holiness. In this mystery, let us pray for an increased faith. Jesus called each of us to conversion, to turn from sin and follow Him. We pray also to always remember God's infinite mercy and love. Lord, grant me the grace of spiritual courage. "The mystery of light par excellence is the Transfiguration, traditionally believed to have taken place on Mount Tabor. The glory of the Godhead shines forth from the face of Christ as the Father commands the astonished Apostles to “listen to him” and to prepare to experience with him the agony of the Passion, so as to come with him to the joy of the Resurrection and a life transfigured by the Holy Spirit." Jesus chose this way to encourage his disciples for the difficulties which lay ahead of them as pillars of the His new Church. Jesus wanted them to fix their gaze on the wonderful goal which is awaiting them at the end. The Transfiguration comes immediately after His first announcement of His passion and His prophetic words about how His followers would have to carry His cross shows us that "through many tribulations we must enter the Kingdom of God" (Acts 14:22). We pray in this mystery, that each of us will carry our own cross with dignity and courage. Lord, grant me the grace of love of our Eucharistic Lord. "The final mystery of light is the institution of the Eucharist, in which Christ offers his body and blood as food under the signs of bread and wine, and testifies “to the end” his love for humanity (Jn 13:1), for whose salvation he will offer himself in sacrifice." Let us offer this decade to the intimacy and depth of God's love. We should be ever mindful of His sacrifice for us, that He gave His life that we should live forever. He loved us to the end but His love did not stop with His death. Jesus lives on through His Resurrection and He continues loving us infinitely. We pray that our desire for Him is strengthening, increasing and flourishing. Lord, grant me contrition for my sins and the grace to forgive others. 10. Jesus answered, "Friend, do what you are here for". At that moment they stepped forward to lay hands on Jesus and arrested Him. (Mt. 26:50) (Hail Mary). Lord, grant me the grace to mortify my senses. Pilate, disturbed at the meek majesty of his prisoner, had him scourged at the pillar; though he could not find any fault in him. Perhaps he simply resented the fact that Jesus had no use for this world, Pilate's world, and spoke so overwhelmingly for the next world. Which way do we view this world? Are we willing to give all, only for this life? Or can we offer and accept our suffering as a sacrifice to God, as Jesus offered His life for us? Lord, grant me the grace to be in the world, but not of it. The coronation, offered to Jesus by the world, was a crown of thorns. How do we crown Him now? Do we deny Him, or simply show indifference? Do we truly seek Him out? The mockery of this pain inflicting crowning, asks us how we crown Our Savior. Lord, grant me the grace of patience in times of tribulation. The Son of God carries the instrument of His death to the hill of Calvary. Jesus' carrying of the cross was fulfillment of His earlier words, Let all who would believe in me, take up their cross and follow me. A cross he didn't have to carry. Neither do we, unless we choose Jesus over Satan and sin. Mary, His Mother states that through the cross, God is being glorified in every person . Lord, grant me the grace of pardoning of injuries. Lord, grant me the grace of faith. Jesus rose from the dead. With it He conquered death, defeated Satan, sin, and the world, and gave new life to mankind. The joy of the risen Christ is greater than pain. The hope that comes from His resurrection is the victory over our own fear of dying. We follow Jesus; follow His steps through this world, and into the next. Lord, grant me the grace of hope. He goes to prepare a place for us, and has returned to The Father in heaven. And He has promised: Where I am, you can be too. Through His ascension, He has shown us a preview of our life hereafter. The Good Shepherd guides us through the valley of darkness. We are constantly tempted, distracted, disillusioned by here-and-now needs. It is Mary who assists, frequently trying to lift us up, trying to prepare us for her Son, asking that we make Jesus the first priority in our life You cannot serve two masters. You cannot serve God and the money of the world. Seek first the Kingdom of God. Let us pray for direction; direction in our lives and for all those who have lost the way; that they may turn back to God. Let us pray that we might give direction to the children in the world, in meeting Jesus. Let us pray that Jesus may become their first priority. Lord, grant me the grace of all gifts from the holy spirit. Before His Ascension, Jesus had said, Because I go, the paraclete will come. The Spirit of God descended upon the apostles. They were empowered with the special gifts of God, to carry on the Lord's work of redemption. With them, was Mary, and the other women, praying with the infant Church. She has never ceased to pray for us and the Church, asking her Spouse, the Holy Spirit, to again touch hearts. She has told us to pray to the Holy Spirit; that those who have the gifts of the Holy Spirit have everything. Let us offer these prayers for our own Pentecost. For an increase in the Holy Spirit's gifts to us. We pray for a deeper faith, and trust in God; for a complete submission to the will of God. Let us pray especially for gifts to the young, for strength that they may be able to stand up to the deception Satan brings to their daily activities. 10. Those who accepted His message were baptized; some three thousand were added that day. (Acts. 2:41) (Hail Mary). Lord, grant me the grace to love you as our lady desires. Mary is assumed, body and soul into heaven. Reunited with her Son, Jesus. Through her assumption, Mary became the reflection of her risen Son. She is also the model of the perfection to which we are called. She represents total submission to the will of God. Mary, as Mother of the Church, protect the Mystical Body of your Son, and our Savior. Here let us ask Mary to especially pray with us for the souls in purgatory; that she might join with us in intercession for those who can no longer help themselves. Those who now entirely depend on us for their final purification. Let us pray especially for the souls forgotten, who have no one to remember them. Lord, grant me the grace of final perseverance. Let us offer this mystery then for Mary's intentions. Her intercession, her constant appearances, her role as Mediatrix of graces. Let us pray that her efforts on our behalf, her efforts to lead all her children back to her Son, will not be impeded. We pray also, to God, The Father, in thanksgiving for Mary's presence, for her role, for her help. We pray in thanksgiving that she is. Hail, Holy Queen, Mother of Mercy, our life, our sweetness, and our hope. To you do we cry, poor banished children of Eve. To you do we send up our sighs, mourning and weeping in this valley of tears. Turn then, most gracious advocate, your eyes of mercy toward us, and after this our exile, show unto us the blessed fruit of your womb, Jesus. 0 clement, 0 loving, 0 sweet Virgin Mary! Pray for us, 0 holy Mother of God. That we may be made worthy of the promises of Christ. 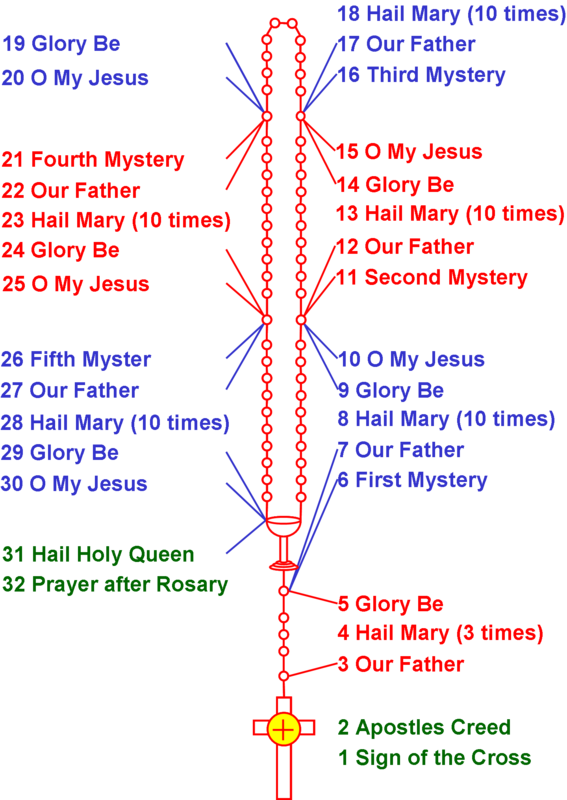 How to pray 7 Sorrow Chaplet: Begin, 1 The Prophecy, 2 The Flight, 3 The Loss, 4 The Meeting, 5 Jesus Dies, 6 Mary Receives Jesus, 7 The Burial, Concluding Prayer. The Chaplet (Rosary) of the Seven Sorrows is a meditation on the mystery-events of God's love for us as reflected in the life of Jesus and Mary. It invites us to meditate on those times in the life of Mary when she experienced the pain and suffering that tested her faith and invited her to a full sharing of the mystery of God's salvation in her Son, Jesus. By this reflection, we open our hearts to the power of each mystery, and so allow His Word to enter and change our lives. This rosary consists of one Our Father and seven Hail Marys for each of the seven Sorrows. The Our Father is said before each group of seven Hail Marys on the separate bead. The Rosary is concluded with three Hail Marys, as added petition for true sorrow and a desire to model our lives on the example of the life and faith of Mary. In the Sorrows of the Virgin Mary we see a reflection of the suffering and bitter anguish of the human Christ. Just as Mary accepted the total mystery of Christ into her life, so may we see in our sorrow, our fear, and humiliation, a dim, but real participation in His passion and death, recalling that if we wish to follow Him, we must "take up our cross" each day. Let us pray that we may accept Christ's call, and become co-sufferers of His passion. Begin with an act of contrition to clear any obstacle before God and Our Blessed Mother. "O my God, I am heartily sorry for having offended Thee, and I detest all my sins, because I dread the loss of heaven and the pains of hell, but most of all because they offend Thee, my God, who art all good and deserving of all my love. I firmly resolve, with the help of Thy grace, to confess my sins, to do penance, and to amend my life. Amen." "Queen of Martyrs, your soul was greatly troubled in the ocean of suffering. We beg you by the merits of the tears you shed in these terrible sorrowful mysteries, to obtain for us and all sinners of the world, the grace of complete sincerity and repentance. Amen." O heart of Mary, conceived without original sin, yet did suffer so much for us, pray for us who have recourse to you."